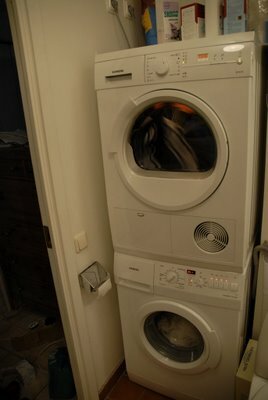 Veritas: New washer and dryer in action! Yesterday Åsa's boyfriend Patric came over and finished installing the new drain pipe for the washer. His friend Richard did some electrical work, changing out the old-style of washer and dryer electrical connections for modern 220-volt electrical outlets. The old-style connections require connecting the wires individually using little screws. Standard outlets are safer and easier. 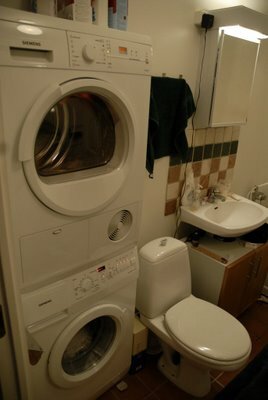 Richard must be strong because he singlehandedly put the dryer on top of the washer. After a few adjustments, it was locked in place. I have already done a few loads of laundry in the new washer and dryer. Here you can see where the washer drain empties into the new drain pipe. 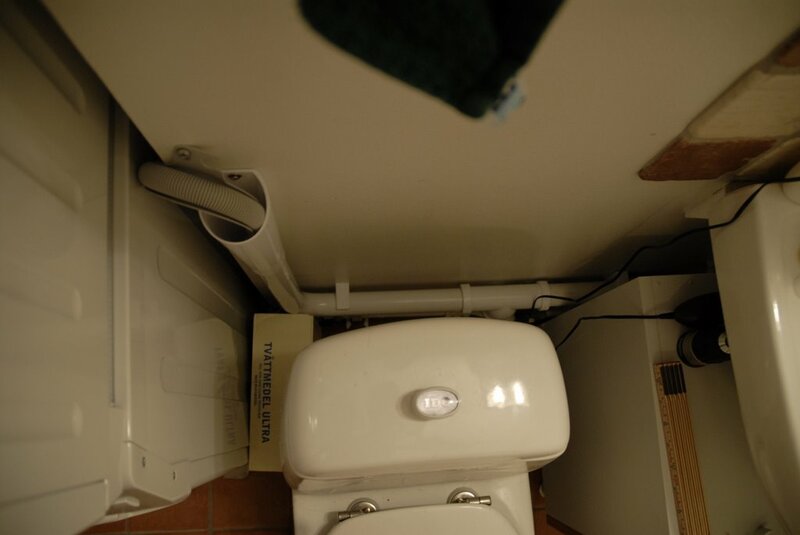 Near the floor behind the toilet is a new water trap to prevent odors from wafting up from the sewer. Now there's only one thing missing: a drain hose from the dryer's condenser. Right now, I have to empty a pull-out reservoir located in the upper left corner of the dryer after every few loads. Once the drain hose from the condensor is in place, captured moisture from the dryed clothes will go straight down the drain and I won't have to bother with emptying the reservior.